Google+ Plus is new social networking service from Google, which is in direct competition with Facebook. As a result, there is no direct method to transfer Facebook friends and contacts easily to Google+ Plus service. However, there is a work-around to import and transfer Facebook contact IDs to Google+ Plus using Yahoo. First we need to import Facebook contact to Yahoo Mail account. 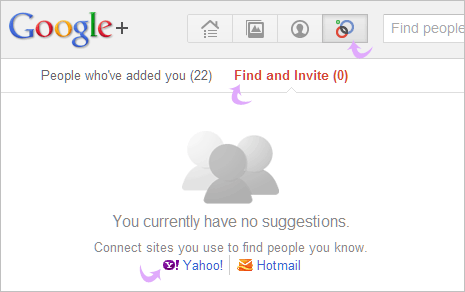 Then we can import Yahoo Mail contacts into Google Plus. This looks complex but it is every easy and whole process hardly take few minutes to complete. End results is sweet with all your Facebook friend on all new Google+ Plus. 1. Login into your Yahoo Mail account (or you can create new account). Then click on Contacts tab at the top of Yahoo Mail inbox. 2. 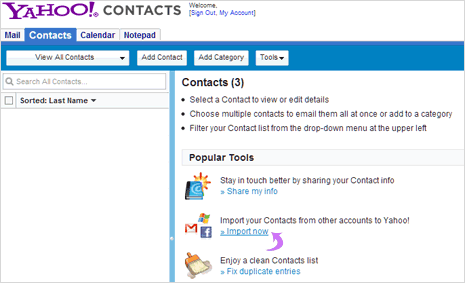 Then click Import Now button next to “Import your Contacts from other accounts to Yahoo!” option. 3. On the next screen, click Facebook button. Then enter your Facebook account login details in the pop-up window requesting for the same. 5. Once data retrieval is completed successfully, you should see something like “129 new contacts imported 6 email addresses added to existing contacts“. Above procedure will import (transfer) and add your Facebook friend contact IDs to contacts address book on Yahoo Mail account. 1. Now login into Google Plus service by going to plus.google.com and then click Circles button at the top menu. 2. Then click ‘Find and Invite’ option and you should see Yahoo Mail and Hotmail options under “Connect sites you use to find people you know”. 3. Click Yahoo Mail button, this will open a new window. You will get prompt to login into your Yahoo account if not already logged in. Click Agree button to share your contacts from Yahoo on Google+ Plus service. 4. You should see your bundle of contacts imported from Yahoo (originally transferred from Facebook) on Google+ Plus. Now you can drag individual contacts to specific circles and organize them as per your requirement.